There’s not much difference between a playground bully, a corporate CEO and the self-absorbed figureheads of many of the world’s current administrations. They’ll all tell you that by surrendering your lunch money or tax dollars, they’re working toward “your best interests.” And we all realize these people are merely imposing a will of their own choosing to enhance their own mythology. Of course, fake benevolence isn’t the sole domain of public figures: Life has taught us the most insidious masters of manipulation come in more covert and intimate forms. Consider your friends, lovers and spouses. 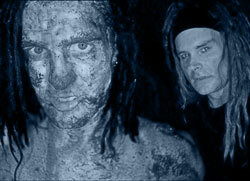 Nobody knows these constructs like Ogre and cEVIN Key, the braintrust behind Skinny Puppy, who, while entering their third decade working together, remain the world’s most forward-thinking electronic/industrial-rock unit. The records they make are harrowing song cycles framed in dark, intriguing atmospheres that explore the concept of control and the manipulation of culture that falsely enhances the lives of the duplicitous. “Between the first SPV release, 2005’s The Greater Wrong Of The Right and the SPV 2007 release Mythmaker, “I went through tumultuous upward and downward spirals within various relationships,” reveals Ogre, who found inescapable parallels between the manipulative aspects of public figures and levels of deceit within his own circle of friends. “The lyrics on recent recordings were inspired by me doing a very detailed post-mortem on several very important relationships in my life. The personality types were different, but their psychological makeup was quite the same. I expanded from my interpersonal realm, and expanding [the songs] into an externalized theme.” The most amazing thing that I’ve found is that people usually look outwards and project on others what they hate the most about themselves. Skinny Puppy’s art has never been something to be taken at face value, and careful attention to Ogre’s commentaries on Mythmaker & Greater Wrong Of The Right will reveal an underlying sense of seething. It is to their credit—and longevity—that Skinny Puppy have been able to simultaneously cast light on societal ills and expand the sonic notions of their music with considerable aplomb. Consider that many of Ogre and Key’s longtime colleagues are resigned to frequently remaking their old records as some sort of self-fulfilling prophecy, while the new guard have nothing to offer outside the realm of bigger hard drives and severe haircuts. Their most recent record, Mythmaker separates both the pretenders—and the resigned—from the sonic anthropology that has been Puppy’s stock in trade. The old adage of “art imitating life” is patently cliché; however, a closer inspection of the big picture guarantees that Skinny Puppy won’t be delivering love songs, party anthems or rock-radio miasma anytime soon. Hell, Ogre and Key are hardwired in a way that practically mandates them from following roads paved by others—or the ones they’ve built themselves. “The experience of making these records has made me examine my own issues of control,” says Ogre. “Not about controlling other people, but control of my own ability to accept certain situations. With the recent decline of world economies and global upheaval Skinny Puppy has never been more relevant than they are today!